Seemingly in the middle of nowhere, but actually in the Chihuahuan desert, this timeless art display seems out of place. 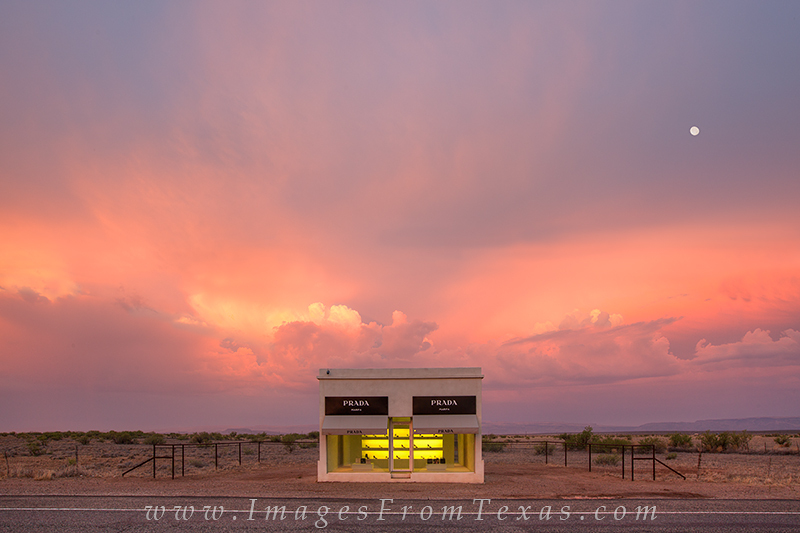 Called Prada Marfa or Marfa Prada because of its proximity to Marfa, Texas, the structure was presented for display in 2005 and has been left to its own devices. On this little highway between Van Horn and Valentine, first light of day lit up the rumbling storm clouds in the west as the full moon was setting. While I realize this isn't in a national park, it is fairly close (relatively speaking) to Guadalupe Mountains National Park (only about 1.5 hours of drive time)! Photo © copyright by Rob Greebon.